If you’ve ever drank a hot cup of coffee, eaten a big bowl of ice cream, chewed on a few ice cubes, or sipped some hot tea, there’s a chance you felt a small tinging or even painful sensation in your teeth. At first, you shake it off, assuming it was a one-time thing. That is, until you eat something similar and it happens again. At this point you’re starting to get worried. “Why is this happening?” You probably asked yourself. What you’re feeling is what your dentist in Reno calls tooth sensitivity, and it can occur in many ways. 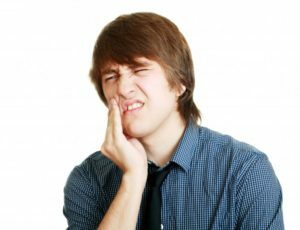 Tooth sensitivity is a sensation that occurs when certain stimuli reach the dentin, a thin layer of tooth that covers the nerve inside your tooth. You’re most likely going to feel tooth sensitivity when you eat foods and beverages that are hot, cold, sweet or acidic. Dentin contains a large number of pores that run from the outside of the tooth to the nerve that lies at the center. Once dentin becomes exposed, these pores become easily stimulated, causing tooth sensitivity. How Do Teeth Become Sensitive? Tooth start experiencing sensitivity when the outer layer of tooth enamel begins to wear down. When tooth enamel is thin enough, temperature changes are much more noticeable because the dentin doesn’t offer much protection from your tooth nerves. Additionally, if your gums begin to recede due to poor oral health and gum disease, the nerves will also become exposed. Tooth sensitivity can also occur if you’ve had teeth whitening treatment done recently at your dentist office or if you’ve recently had dental surgery. This form of sensitivity is only temporary and not indicative of wearing tooth enamel. However, if your Reno dentist says that your teeth show signs of teeth grinding or you’ve chipped or fractured a tooth, you’ll want to seek treatment in the near future to prevent your tooth enamel from wearing down even worse. Is There Treatment Available for Sensitive Teeth? Since tooth enamel is non-regenerative, it cannot be restored once it has been lost. However, there are some restorative methods available that can reduce sensitivity. For example, if it’s occurring because of a cavity, your dentist can place a filling to cover the exposed dentin. They can also use a dental bonding agent to seal the area or provide a fluoride varnish, gel, or foam to strengthen tooth enamel. At home, try using a soft-bristled toothbrush and less abrasive toothpaste to make your oral care easier. Make sure not to brush too hard or for too long so you don’t wear down your enamel. Use a toothpaste with a high concentration of fluoride and look for toothpaste designed to soothe the nerve endings in teeth. Need to treat a cavity that’s causing your tooth sensitivity? Don’t put it off. Schedule an appointment with your dentist in Reno today to get it treated! Dr. Josh Branco earned his dental degree from Boston University and has been serving the northern Nevada community since 2009. He’s currently a member of the ADA, the Academy of General Dentistry, and many other relevant dental societies. To learn more about how he treats tooth sensitivity and about his practice, contact him at (775) 409-4282 or visit his website.